In this article I’ll help demystify concept testing and show you how even on the leanest of budgets, you can rest assured that you know what you need to know to take your concept to the next stage. Have you been thinking about an idea for a new product? Have you tested it to see how it will be received in the marketplace? Concept testing may be one of the most important steps you’ll take a long the way and to do it effectively you should have some specific goals in mind. Whether your business is large or small, the goals of concept testing are the same–to conduct the test among the widest segment of the appropriate population. Fortunately these days social networks provide an easy and cost-effective solution for targeting and segmenting potential audiences. Characteristics of the customer; age, gender, income bracket, education, job, and cultural background, lifestyle, such as social class, lifestyle, personality, opinions, and attitudes. Specific customer behaviors e.g. online shoppers, shopping center customers, brand preference and prior purchases. Geographical location such as continent, country, state, province, city or rural that the customer group resides. An integral part of the preparation stage is being able to identify characteristics of your ideal customers and solutions they might be looking for. Who are the ideal customers? Does the product already exist? What is the customer doing currently? What is the all-in cost of the current solution? What asset or capability are you bringing that is unique? How will competitors react to a successful launch? How can you test and learn before building the entire structure? If you’re ready, carve out some time and write down your responses to these questions and you’ll be well on your way to taking the next step, designing a survey. The design phase is very important. After all, once you have gained your participants’ attention you’ll want to make sure that you’ve thought through a number of factors so that people will stick-in and complete the survey. 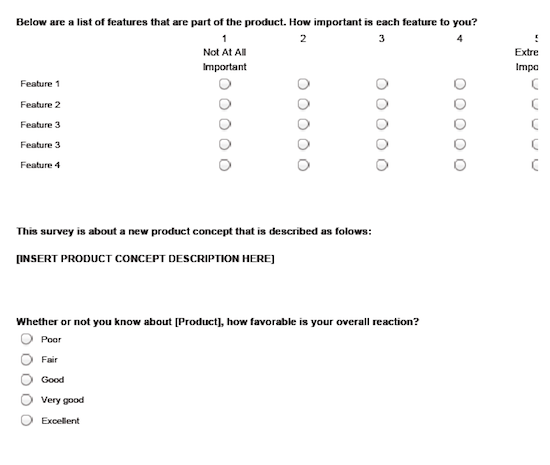 Describe the concept in a clear and understandable way and include product benefits. Familiarize yourself with the variety of question types and determine the best formats to use e.g. multiple choice, fill-in-the-blank, open ended, rank order, and questions in matrix tables. Identify distribution channels for ways to best engage participants: email website, blog or QR codes; mobile compatible surveys; social network integrated—Facebook, Twitter, Linked-In. Estimate how much time it will take for participants to complete the survey. 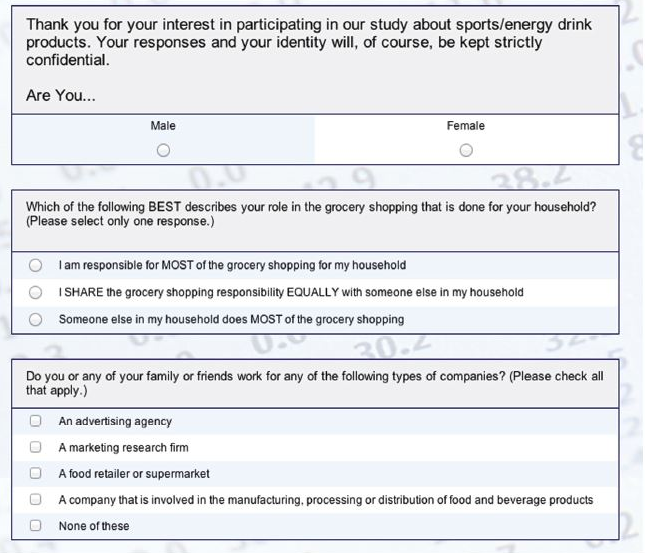 The number of questions may vary from one survey to the next. Keep online questionnaire length under 20 minutes. Evaluate each questionnaire to eliminate “nice to know” questions (i.e. questions that don’t directly relate to the objectives and success criteria). Keep the number of questions asked prior to concept exposure to a minimum. Think about questions from the respondent’s point of view – if you were a respondent would you want to answer? 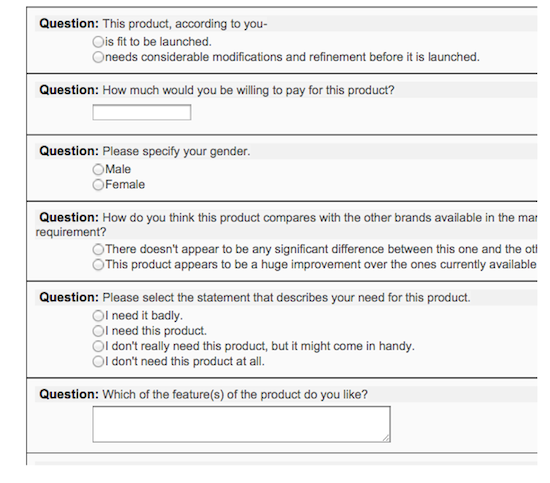 For example: Use technology to make questionnaires more respondent friendly (e.g. to skip questions that don’t apply). Watch out for repetitious questions. You may think you are asking different questions (e.g. 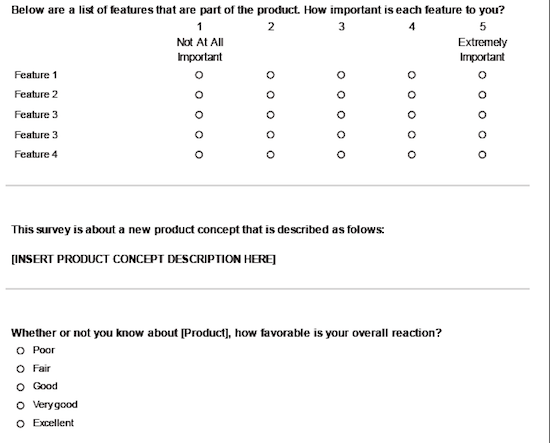 product is healthy and product is good for you), but respondents often don’t see it that way. Consider using split questionnaire designs to break a long questionnaire into manageable tasks. The second questionnaire is fielded to those returning the first questionnaire. This makes the task a little less daunting for respondents while still gathering all the information from the same respondents. It’s always good to know that there are some ready-to-use online resources. We came across several templates that will help to get you started with concept testing without having to reinvent the wheel. The importance and thoroughness of concept testing cannot be emphasized enough. Your ideas deserve the best shot in the marketplace; take the necessary time and steps to make your business a success.